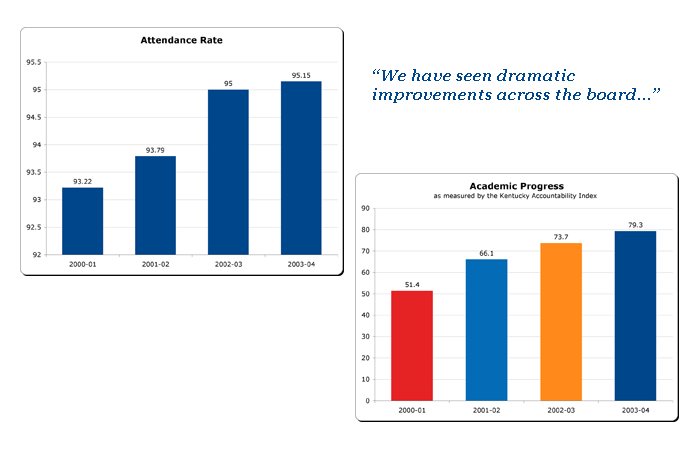 "We have seen a dramatic improvement across the board in student attendance, staff attendance, and academic progress." 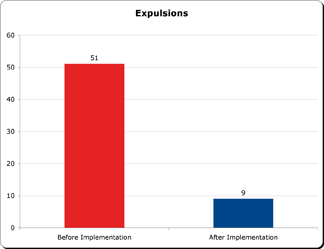 "Between the 2000-01 and 2002-03 school years, office referrals dropped from 413 to 236—a 43% reduction. Office referrals jumped up in 2004 because there were five teachers out on leave that year and the substitutes had not been taught CHAMPs procedures." "We went from a school with the most suspensions and expulsions in the district to the school with the least." 76% of students qualify for the Free/Reduced Lunch Program. Before implementing Foundations, our school had low expectations, a non-caring culture, negative community perception, and poor academic performance. Now, we are recognized as a Kentucky Rewards school, a National School of Merit, a national pilot site for Plato software, a national demonstration site for Project CHILD, and a Distinguished Media Center for Kentucky. In addition, teachers from our school have received the Kentucky Teacher of the Year award for two years in a row. And, in 2004, we were among only six schools across the nation to receive the National School Change award—a recognition of schools that have demonstrated a significant change in performance.